I would assume pre-'97 because that's the first year the OBD-II system was in place to determine if emissions systems are working --- interesting that they believe this would only impact about 10% of current cars that travel into the city ... no question smog is a big issue there. So, with all these other countries banning ICE vehicles (yes, I know Paris is a city and only two such proposals are out there) , Can the US get in on all that "extra" gasoline that those places won't be burning? We gots roads to drive and alot of 'personal' big trucks. This way EVs will never catch on. Big win, big oil! Go US of A. You just know that petrol-heads are thinking this way. I am old enough to remember my own childhood headaches caused by rather heavy smog in Los Angeles. Older "classic" cars, and some beaters remain, along with some 2 cycle motorbikes, and non regulated diesel vehicles. Not sure if it's driving the LEAF, but for some reason, my sensitivity to the poison has risen, and I loath being in their exhaust plume, and will literally pull over to let it dilute into the atmosphere. While I'm not such a fan of government interference, some rules really do serve us all... Using the air as a sewer has never been seen as a right by me... Never. 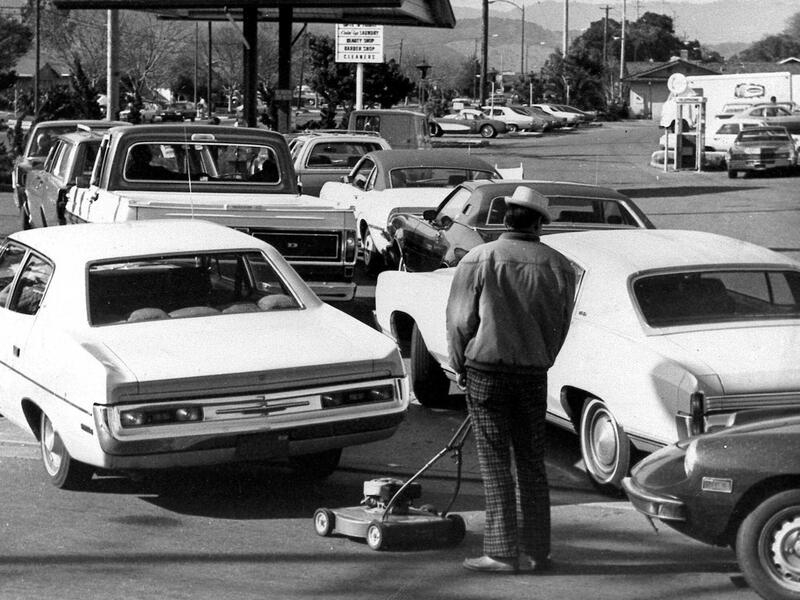 Hey, I'm old enough to remember the 'gas crisis' years where in 1973 they did odd and even plates at the pump ... I was working at a grocery store at the time and the manager would throw the keys to his Olds 442 to me to wait for gas while being paid ... kind of nice to simply go home now and my 'station' is always waiting for me ... love this photo with the guy with a gas mower; hey that's also electric for me! JimSouCal wrote: I am old enough to remember my own childhood headaches caused by rather heavy smog in Los Angeles. Older "classic" cars, and some beaters remain, along with some 2 cycle motorbikes, and non regulated diesel vehicles. Try riding a bike in traffic, and you'll be even more sensitized I normally ride up to the head of the line so I don't have to sit breathing a car's idle exhaust. Of course, every once in a while there's an EV in front of me, so I can stay put. However, if there's a head wind and there's other ICEs in front of them I'll still ride up to the front. In any case, it's safer to be out ahead where everyone can see me. Wonderful solution, was my first though. banning only pre 1997 will help very little. Stage 1 ban should be all pre 97 vehicles and all diesels before 2004.
easy fix is DPF removal) starting at 2004. Now they went to "vehicles without a plug". And that is way more reasonable. BMW offers many. Mercedes offers some. VW GTE, i3 ReX and many more will come. I really like the idea of banning new vehicles WITHOUT a plug. Nothing to do with vehicles that are already in use. Except force them to be in top notch shape. are in good shape, no modifications). I see they're going to start charging more to park your diesel car in towns & cities up to £2 an hour more than a petrol car as well as setting up an 'ultra low emission zone' in cities. They really have become public enemy number 1 since the VW emissions debacle. Diesel cars are soon going to be restricted as to where you will be allowed to drive them. one reason I want to cut my ties with ICE cars. They have a government app where you can type your car registration into it & see if you will be allowed to drive in cities when the new rules become law. My car didn't pass, although my car had just passed it's yearly MOT emissions. redLEAF wrote: Hey, I'm old enough to remember the 'gas crisis' years where in 1973 they did odd and even plates at the pump ... I was working at a grocery store at the time and the manager would throw the keys to his Olds 442 to me to wait for gas while being paid ... kind of nice to simply go home now and my 'station' is always waiting for me ... love this photo with the guy with a gas mower; hey that's also electric for me! I'm old enough to remember those days as well. I would sometimes wake up early and join my Dad as he went to the gas station at O'dark thirty to get in line for gas for his Plymouth station wagon. Of course being so early I promptly fell back asleep again.